- See your trophies, level, avatar, progress and other data. - Keep an eye on your friends' trophies. - Supports PS3 and PS Vita. - Live tile with latest trophies information. - Data separated by games and trophy types (bronze, silver, gold, platinum). 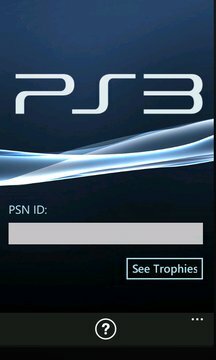 - Click on a game to see all trophies for it, with name, description, icon and date. - Get tips to earn missing trophies! - Records the last informed username. 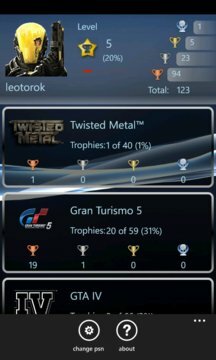 - Unique design, similar to Playstation 3 XMB and PSN themes. - Data cache (low bandwidth required, perfect for 3G networks and limited data plans). If you are one of the happy owners of a PS3, this app is a must have! Developed by Leonardo Torok at Allen Tecnologia.